Today’s guest is ...Dean Da Costa...Dean is a Strategic Sourcing and Research Technologist at a Fortune 100 company in the Seattle area. A decorated veteran and recognized sourcing expert with more than 20 years of experience, he currently writes The Search Authority, one of the most influential blogs in the business. 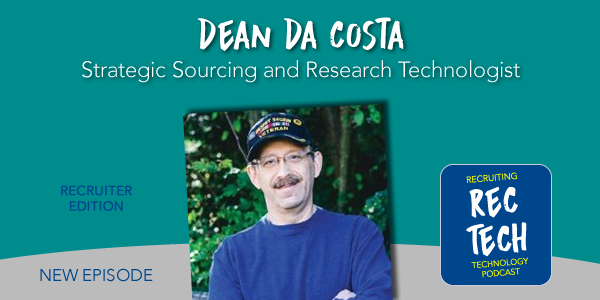 A frequent speaker on the recruiting conference circuit, His insight and knowledge (particularly of technology) has made Dean one of the top sourcers and full cycle recruiters in the business today. Let’s start with the recent Linked User Agreement changes which is causing a lot of uproar among your fellow recruiters and the various Chrome Extensions they use...can you explain what it says and what that means for recruiters/vendors? Does it affect every extension on the market that uses LI in some way? You say InMails are a waste of time...why? What’s your open rate? How much do you spend on these tools each month? When it comes to vendors pitching you...what are they doing wrong? How should they approach people like you? Want to be a guest on RecTech? Contact us and tell us why.